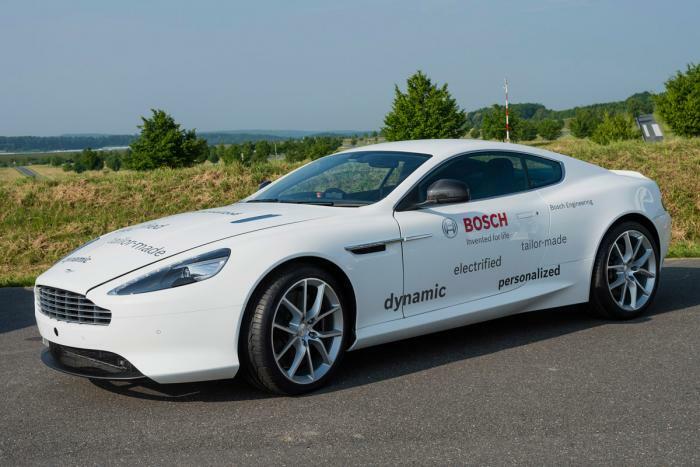 Bosch has revealed a hybrid Aston Martin DB9 complete with electric motors, torque vectoring and plug-in recharging making the DB9 more economical and powerful. The hybrid DB9 hasn’t been built to preview a production hybrid DB9 but to demonstrate what Bosch can do with an existing car. Aston Martin donated the DB9 to Bosch for the hybrid project, and Bosh has fitted the DB9 with two electric motors – one at each front wheel – which gives the DB9 something in the region of an extra 250bhp to play with. The electric motors on the front wheels turn the DB9 into a 4WD supercar, with an generator sitting next to the V12 to charge the lithium-ion batteries sitting ahead of the back axle. The plug-in hybrid setup adds something like 300kg to the DB9′s weight, but 50 per cent more power more than makes up for that, with 0-62mph now expected to be in the mid 3 seconds range. Handling is also improved by torque vectoring from the electric motors on the front wheels, complete with four modes - safe, sport, drift and custom – for the ultimate handling setup. Owners could also remotely “tune” it to a super-safe mode and lend it to other family members, safe in the knowledge that top speed and acceleration would be limited. It’s all a showcase for what Bosch technology can do for existing performance cars, but we reckon Aston Martin should be biting Bosch’s hands off to build a production DB9 Hybrid.